RB Leipzig conceded five goals in a promising start to the season where they are still unbeaten with three wins and three draws. 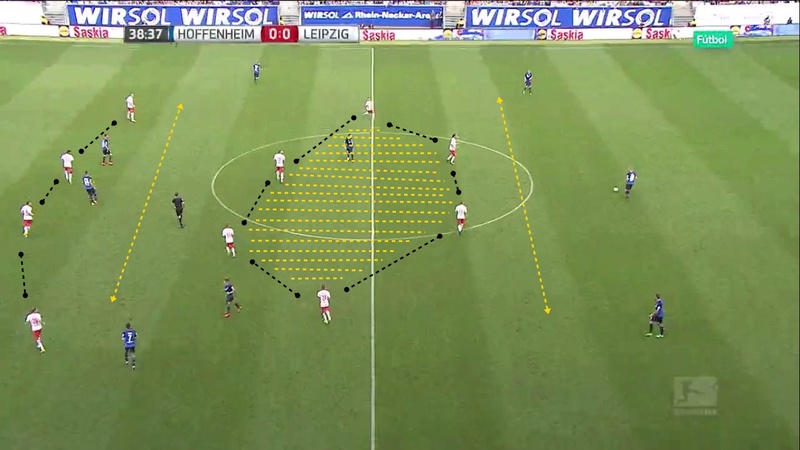 To begin analysing how RasenBallsport work without the ball we should note in which areas do they press and where are they positioned to make that pressing effective. Their main formation is the 4-4-2. The team displays two forwards, and behind them in the midfield area, a line of 2 + 2 with the tendency to be close all the time, regardless of the area where the ball is. Such organisation explains the key feature of their pressing mechanism. They try to lock the central paths to force their rivals to use the flanks. That 2 + 2 + 2 lines are focused on avoiding through-balls by closing interior spaces in the midfield area. The intention is clear: to be well placed in a 4-4-2, tilt the block and close any option of an interior pass. What does this produce? The aim is to force the opponent to the sides of the pitch. Through tilting the block, RB Leipzig get their rivals to outer zone where the intensity level goes up, with the whole team pressing. The striker’s movements are important in this phase, for they have to rotate over the area where the ball is. Each forward is responsible for starting the pressure on the centre back or right back of the opposite team. Once the movement starts, the work of both right and left wide midfielders, central midfielder and the fullback is key to close pass-lines and spaces to the holder of the ball. The image below shows the exact areas that are chosen to raise the intensity levels and where they press seeking to gain possession of the ball. Notice first the inside passes, where midfielders are always close, trying to cut and steal the ball. Secondly, take a look at the wings, as that is where the team makes most of their pressing. Regarding the defensive transition, it is somewhat lacking of quality for it sometimes gets messy near their own box. The team gets unbalanced, leaving free spaces in some areas due to lack of work from some players at certain times. They defend in 4-4-2 tilting to the flanks where they increase the intensity with the intention of an easy recovery of the ball possession. 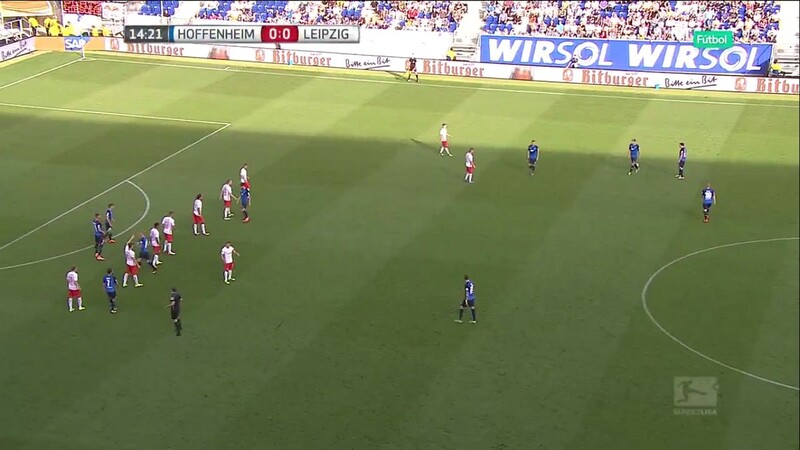 The team’s aim against a possible long ball from a set piece is to be as far away from their goal as possible, so they form an orderly line a few meters ahead of their own box and avoid going back. 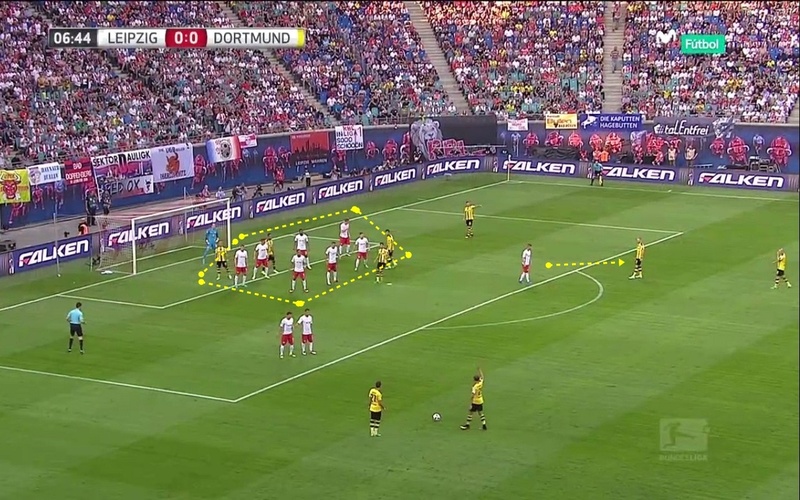 Leipzig’s defense coordination is key to get that right. The most peculiar way of defending a set piece by die Roten Bullen comes when the foul is committed close to the box. They use a zonal marking in a 4 + 3 display around the six yard box, closing the spaces that may be generated. Depending on their rivals’ display, they can mark players individually outside the box. To defend corner kicks, both centre backs are released from individual defense. One defends the near post while the other remains in the middle of the six yard box. This role is probably applied to take advantage of their strength and height in order to clear the ball. The rest of the team displays man marking. Six rounds into the Bundesliga allow us to guess some trends and RB Leipzig stand out in the competition so far regarding one of them — they are second best in shots against. The team forces their rivals to shoot more from outside the box than from the inside. No other Bundesliga team has achieved this in the current season. They barely receive shots on goal against (two per match). On a negative side, their rivals have found the back of the net in five occasions which is probably too much for such a low offensive production. Anyway, with such short numbers, a goal here or a save there can change this outlook a lot. Regarding expected goals, RB Leipzig have overcome their rivals in every match this season. That leaves them as one of the top teams of the current Bundesliga, only behind Bayern München and in close competition with Borussia Dortmund, which they beat one to nil in the second round. 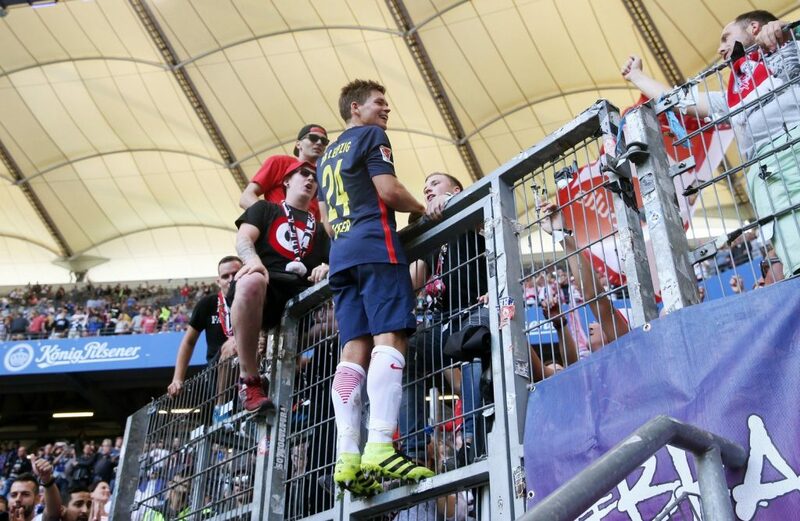 Ralph Hasenhüttl pupils are building a solid alternative from the defensive line.